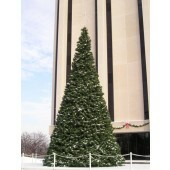 Manneco is proud to be able to offer our customers several choices of giant Christmas trees. Our Heavy-Duty, American made Rocky Mountain Pine and Oregon Cascade Fir trees are 100% made in America and are the finest Giant Christmas Trees available! Our Rocky Mountain Pine Trees come standard with five (5) C-7 incandescent lamps per panel or branch while our Oregon Cascade Fir Trees come standard with ten (10) C-7 LED lamps per panel or branch. 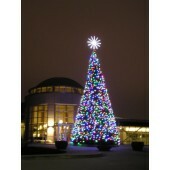 Options include your choice of several styles, colors & types of garlands and a vast assortment of tree toppers and ornaments. We have made several very special giant trees including a Santa House within the tree as well as special opening for such things as escalators and stairways. These are our Heavy-Duty "panel" or "modular" type trees which can "GROW" in 2' increments from year to year to our largest tree on record that being 110' in height! Manneco also brings to our customers a slightly more economical series of import trees - our Paramount Pine & Noble Fir Trees. 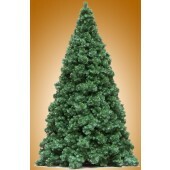 These imported giant trees are an excellent product and value.